It has long been suspected that dams and reservoirs provide extra moisture to the atmosphere and increase rainfall in the area around the reservoir. 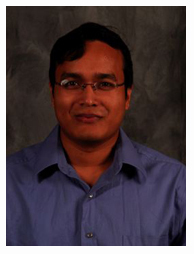 In December 2009, Faisal Hossain, of Tennessee Technological University, demonstrated that certain dams could make such rainfall events more extreme and frequent. The research catapulted Faisal and his research group — Sustainability, Satellites, Water and Environment (SASWE) — into the media spotlight, including a February 2010 interview with The Naked Scientists that aired live on the BBC and a feature in National Geographic News. Hossain and his SASWE group — largely funded by NASA grants — also work to improve the ability of developing nations to monitor water resources that cross national boundaries. In April 2010, the group will be recognized by the National Association of Environmental Professionals with an education excellence award. WhatOnEarth caught up with Hossain to learn more about the group’s work and outreach efforts. WhatOnEarth: What is satellite hydrology? Hossain: We study the availability and movement of water on (surface), under (ground) and above (rain) earth’s surface by looking down from satellites in space. Today there are many satellites with instruments that can ‘read’ how much water might be flowing in a river or in the air, and also how wet the ground might be. Because Earth is 75 percent ocean and because land regions are too vast and expensive to completely survey, satellites provide the cheapest convenient and global way of monitoring the flow of water. WhatOnEarth: What are some of the water issues your group is looking to solve? How? Hossain: Today, more than 50 percent of the global surface flow is shared by multiple nations. 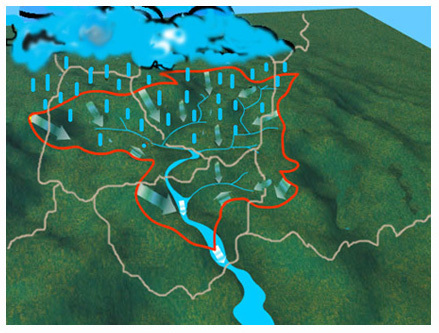 Also, the numerous artificial reservoirs — more than 100,000 — built mostly in the upstream nations not only have vital implications on water supply for nations downstream, but they can also act as catalysts for increased flooding through heavier precipitation. Without adequate treaties for trans-border cooperation, and without adequate knowledge of how dams alter climate, future water scarcity due to climate change and aging water infrastructure is likely to make nations more vulnerable to water disasters. SASWE is probably the first to demonstrate clearly the value of planned space-borne water measuring missions, such as the Global Precipitation Measurement (GPM) mission, and how they may improve disaster preparedness and environmental management. WhatOnEarth: Does your research impact people’s lives? Hossain: Many developing countries in Asia, Africa, and South America, are flood prone and yet unable to forecast floods due to the lack of basin-wide rainfall and stream flow data. Our group is helping to validate and improve NASA’s Global Flood Detection System, which uses rainfall data from NASA’s Tropical Rainfall Measuring Mission, and will also use NASA’s planned GPM mission. For instance, Bangladesh is situated downstream of the Ganges-Brahmaputra-Meghna basin but does not receive any upstream river flow and rainfall information in real time from India during the critical monsoon season. Bangladeshi authorities measure river flow at staging points where the three major rivers enter Bangladesh and at other points downstream. On the basis of these data, it is possible to forecast flood levels in the interior and south of Bangladesh with only two to three days lead time. Theoretically, future NASA satellite missions could increase this lead time to anywhere from 7 to 14 days depending on the time for stream-flow to drain out from the Himalayas to the Bay of Bengal. A longer forecasting range would improve decision-support tools that ingest these warnings. For example, 7- to 10-day forecasts are much more useful than daily forecasts in monsoon-affected Asian countries for informing farmers of the potential benefits of delayed sowing or early reaping of crops. A 21-day forecast is considered most ideal. Extended forecasts also assist in economic decision-making through early disbursement of loans to rehabilitate regions that might be affected by floods. WhatOnEarth: How are public outreach and education part of your team’s mission? Hossain: We are working with developing nations for climate change adaptation under a joint program with the Institute of Water Modeling (Bangladesh), Tennessee Technological University, and Ohio State University. In this program, staff from Bangladesh receive training each year on environmental management, stewardship and state-of-the-art satellite technology for adapting to climate change. The staff returns home and explores ways to implement the knowledge in their environment and to serve as a model for other developing nations. Image Details: Water within a generic watershed boundary (red) can cross many political boundaries (top image). Both images are courtesy of Faisal Hossain, Tennessee Technological University.